If doing Perl programming or if another package requires a Perl module, learning how to install one may become necessary. The recommended way to install a Perl module is through the distribution’s repositories, however, they can be installed manually with Perl. A configuration message will appear… most users will be good with the automatic configuration it recommends. If additional configuring needs to be done later typing o conf init will re-run the configuration dialog. To leave the shell type exit. The first requirement most people will need to do is build and/or update the CPAN module. Modules can be installed with the built-in module in three ways: from the module shell, from the perl command, or from the CPAN module binary. Note: CPAN itself recommends using the cpanm module for installation. Modules will need to be reloaded after being updated: reload cpan. Modules are sometimes executable binaries and if they are known to the shell can be executed like any other command. Some modules are support modules and can only be used for programming or by use of another module. Information of installed modules can be discovered with the command perldoc perllocal. Module maintenance is typically unexpected after installation and the built-in CPAN module has no ability to be able to do so. If the cpanm module is installed it does have the ability with the --uninstall/-U option. It will display the files to be removed and prompt for approval before uninstalling. This entry was posted in Arch Linux, Command Line, Linux on 2016-01-27 by Todd Partridge. As a person who likes to write it has always been helpful for me to have a dictionary nearby. As a regular command line user to have a dictionary I could access from there was something I really wanted. I hadn’t predicted this would be much of a task, however, I found it an uphill battle. In my original attempt I didn’t find any. I looked at a number of programs but most were inadequate in one way or another. I was baffled and I almost gave up looking. I did eventually find one but before that the two most promising programs were dictd and sdcv. Dictd is a protocol/software-framework for a networking dictionary, it contains both a server and a client. The idea is to have a server where numerous clients can connect to it. This would be useful for local network use or for something like an online dictionary group. However, it seems that the development has been quiet, and I had trouble installing several of its dictionaries… I could never get it to work. start the dictd daemon (requires very little overhead) and check if the dictionaries are available (dict -I). I used to use this program (Stardict console version) for years. It provided a basic, easy-to-use, unambiguous, definition. These days, however, the parent program StarDict is no longer in development. Additionaly, there were formatting problems that broke reading flow, and made it difficult to read. wn - command line interface to the WordNet lexical database... it outputs synsets and relations to be displayed as formatted text. In more human-speak: it details relationships between words. Its use as a thesaurus would be of a more direct comparison; however it can work for a dictionary as it does provide definitions and contextual examples. The definitions may be basic, but they are to the point. The only feature it does not provide that I use sometimes is word pronunciations. The output of wn can be difficult to read: it jumbles a lot of information together, and only roughly organizes it. (FYI, in the above example I’ve filtered out a couple lines.) To help the reading of it in a smooth natural way, I’ve created a couple scripts to format the output. One script is called dict and the other is called thes. I’ve put them in a repository for any who are interested. This entry was posted in Arch Linux, Command Line, Linux, Script on 2015-02-06 by Todd Partridge. This colorscheme is what I’m going to use for awhile. Because I spend a lot of daytime at the terminal, this colorscheme works well for the eyes. I like it quite a bit. Thank you to all the colorscheme designers who have helped my editing out. This entry was posted in Arch Linux, Vim and tagged colorscheme on 2014-03-25 by Todd Partridge. xuserrun is a bash script to detect the first X.org server environmental values, these values are then used to transmit a command to it. The script is primarily useful from another environment: a different user, from the tty console, from cron, a boot script…. xuserrun requires systemd. xuserrun notify-send "Remember to get bread." I have put it in its own repository. This entry was posted in Arch Linux, Command Line, Linux, Script on 2013-08-07 by Todd Partridge. Good for me to have this around so I can remember everything :), and it is in the AUR. This entry was posted in Arch Linux, Command Line, Script on 2012-06-18 by Todd Partridge. If you ever have an emergency and need a rescue disk to recover your Linux install, or maybe you just want to brag to your friends there’s some good LiveCD/USB’s out there and many distro’s now make LiveUSB install images, but it is also possible to create your own customizable LiveUSB. Hey, if you’re willing to put the time in, you can have a portable Linux in your pocket. There’s alot of articles about creating your own custom CD/LiveUSB but many of them seemed dramatic involving messing with things like syslinux… Plus many of these create a fixed image, meaning that once it’s on your USB it can’t be changed. But having a customizable Linux on a USB flashdrive isn’t that difficult – just install Linux to the USB drive. The first thing you’ll need is at least a 2GB flash drive. Anything less and you better plan a real basic install. First thing you might like to do is partition the flash drive. This isn’t necessary but I was pretty sure I wouldn’t need the 4GB for what I needed so I partitioned the flash drive to have a 1GB FAT32 partition first (so that Vista can see any files I put on it) then I partitioned the remaining 3GB as ext4 with parted. No need to burn an ISO and reboot, use VirtualBox and do it from your desktop. You can follow my Testdrive a LiveCD with VirtualBox post to getting VirtualBox setup. I personally used Arch Linux for this install because it’s easy to configure. Note: At the time VirtualBox does not have 64bit capabilities. If you want to install a 64bit Linux on your flash drive best to boot a LiveCD and follow these instruction from there. Boot the LiveCD/USB iso/img in VirtualBox then in Devices > USB devices select your flash drive. Now the installer will recognize your flash drive. Proceed to install the distro on the flash drive. If you partitioned beforehand you can skip partitioning and go to setting Filesystem Mountpoints. When you reach GRUB setup be sure to install GRUB on the flash drive itself, for me it was /dev/sdb. Be sure NOT to install GRUB to a partition, it should be at the beginning of the drive. Because your BIOS is likely setup to recognize your hard drive before your USB drive you get drive denominations like /dev/sda for your hard disk and /dev/sdb for your flash drive on regular bootup. If booting from a flash drive, many BIOS’s have you enter a key (mine is F10) to get to a Boot Menu. So when you select your flash drive in your BIOS Boot Menu your flash drive now becomes /dev/sda, hard drive /dev/sdb. In grub terminology this is hd0 and hd1. Most BIOS’s are like this (though there a few exceptions). To know for sure you won’t be able to detect this until you try and boot your flash drive (more below). The (hd0,1) value denotes the partition number, again starting with 0. So this denotation tells GRUB the root filesystem is on the first drive, second partition. And a couple other things following the Beginner’s Guide. HOOKS="base udev autodetect pata scsi sata filesystems usb"
The -k option needs to be specified to use the chrooted kernel and not runtime kernel that is being used by chroot. Now reboot and get to the BIOS Boot Menu. As I said, all BIOS’s are different so keep an eye for a key to get to it. Once in the Boot Menu select your USB drive. now press tab and it will show you the availble drive and partitions. Enter the correct one, hit escape and then b to boot. That’s it, you should now have your own customizable Linux USB drive. I was a bit surprised. I didn’t think a USB drive would be much different that a CD/DVD but actually it was alot faster. And I just discovered that I’m using a USB 1.1 flash drive. :) Not quite as quick as my hard drive but definitely not bad. 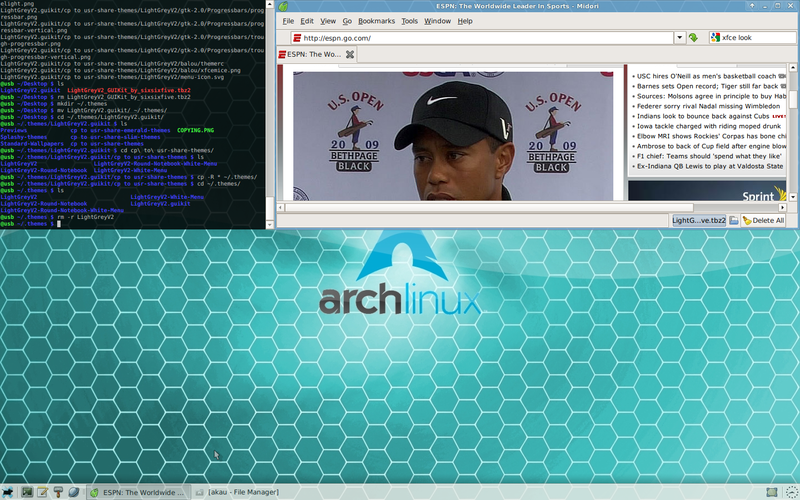 This is also the first time I ran without an xorg.conf and my desktop runs great. Definitely worth a try if you ever need a rescue os to fix problems with. This entry was posted in Arch Linux, Linux on 2009-06-20 by Gen2ly. Here is a gathering place to share common bits of Linux knowledge. Learning with the operating system is a hobby for me. I enjoy getting along with people and being part of something everyone can contribute to. Comments, tips all liked. If desired you can learn more about me or view the number of scripts I've wrote. PCI, PCI-X, PCI Express - Oh boy!